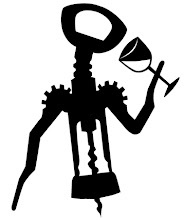 Food ~ Wine ~ Fun: Wine-down Wednesday- A Popping New Year! Wine-down Wednesday- A Popping New Year! 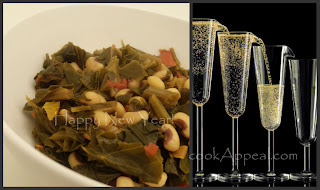 I am including a southern tradition of eating black-eyed peas for good luck. My mother as I grew up in Texas made these, my grandmother on both sides made these, and most everyone I knew made them all year long. I have been stuffing these down my friends, hubby, and myself for the past month. I can remember my roommates in college from the north had no clue what they were; until they met me! My twist is making them with some collard greens, Virginia ham (present from my friend Lisa for Christmas! ), veggie stock, red wine vinegar red onion, and a splash of sparkling wine! The perfect dish to eat with bread and butter. 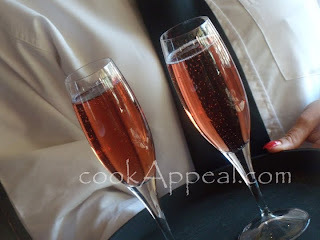 Dig in while we* talk about a good bubbly to roll in the New Year! This just seemed natural to talk about what to drink for New Years, but in order to do this we need to explain what types of Champagne and sparkling wines are out there. I will talk about why some are so expensive, and some are, well, just cheap! True Champagnes is worth the money, but there are a few sparkling wines out there that are note worthy. Definition/History: Sparkling wine is a wine with significant levels of carbon dioxide in it making it fizzy. The carbon dioxide may result from natural fermentation, (either in a bottle, as with the méthode champenoise, or in a large tank designed to withstand the pressures involved (as in the Charmat process) or as a result of carbon dioxide injection. In some parts of the world, the words "champagne" or "spumante" are used as a synonym for sparkling wine, although laws in Europe and other countries reserve the word Champagne for a specific type from the Champagne region of France. The French terms "Mousseux" or "Crémant" are used to refer to sparkling wine not made in the Champagne region. The United States is a significant producer of sparkling wine: California in particular has seen French Champagne houses open wineries in the state to make American sparkling wine according to the Champagne method. This includes Domaine Chandon from Moet, and with all the fuss made over Champagne it's easy to overlook California's many outstanding sparkling wines. Mumm Cuvée Napa was started by French Champagne Mumm, then was acquired by Seagram, itself acquired by Diageo of England, which recently sold the operation to Allied-Domecq, another British Corporation. It reunites Mumm Napa with Champagne Mumm, however, since that company is now also part of Allied-Domecq. Washington State and California both are producing some great sparkling wines under $20 these days. Recently the United Kingdom, which produced some of the earliest examples of sparkling wine, has started producing Champagne-style wines again. Sparkling wine is usually white or rosé but there are many examples of red sparkling wines such as Italian Brachetto and Australian sparkling Shiraz. The sweetness of sparkling wine can range from very dry "brut" styles to sweeter "doux" varieties. Many people stray from Rosé Sparkling wine, but I suggest serve them to guest who are a bit finicky and lean toward the sweeter varieties of drinks. Not all Rosé are sweet, so ask your wine retailer for recommendations. Roederer Estate Brut Rose Sparkling Wine, $24.99- a blend of 60% Pinot Noir and 40% Chardonnay. This is full and round with smooth flavors and fine persistent bubbles. The extra measure of Chardonnay contributes elegance and austerity, which balance nicely with the delicate fruitiness of the Pinot Noir. Persistent and very fine perlage; rosé color; aromatic fragrance, whole and delicate, sweet and pleasant flavor. Brachetto D´acqui Rosa Regale Banfi, $21.99- enjoy as a delicious aperitif, between-meal or after-dinner sparkler! This French bubbly will go with loads of oysters, creamy brie, or a good loaf of sourdough bread and butter. Hubby and I personally recommend this, as we served this at our wedding reception after falling in love with each other and the first sip of this bubbly! We still keep a bottle or two in the cellar for special occasions and anniversary celebrations! Tasting Notes: A light golden colour, a floral nose subtlety dominated by white fruit such as pear and apple, but also containing a hint of almond and hazelnut. A balanced and elegant Champagne that draws its strong personality from exceptional vineyard sources. This is a favorite of my hubby's step mother, Valerie on the North Fork, LI. She will open this up, and add a touch of raspberry or any festive fruit to toast in the new year! Tasting Notes: Golden-yellow, with a foaming necklace of tine bubbles. Next it is so pleasing to the nose: initially reminiscent of white fruits and raisins, then of vanilla and later of brioche. Note the fine balance between the fruity aromas coming from th grape varieties and the toasty aromas following the aging in the bottle. The first sip delivers all the freshness and forcefulness so typical of Yellow Label with a symphony of fruit tastes following on. Here is a true member of the powerful Brut family, well structured, admirably vinous. The lingering aromas echo and re-echo, with each fruit or spice note distinct. Cavas from Spain are bargains at $20 and under, some at under $12. Banfi Rosa Regalia (Italy) dessert sparkler with raspberry hints; two years ago $16, now about $20. Salads- Serve a Greek, and do not forget to make the dressing with a splash of the sparkling wine you use! Seafood, Sushi or Sashimi- Shrimp, Tuna, or California Rolls full of creamy avocado! Lobster of course! Pizza with mushrooms, white sauce with shredded chicken or a taco beef will work with this favorite. Fried Foods work perfect with the flavors of Cava, Spumante, and most sparkling wines- Taquitos with guacamole, Fish n Chips, and even Chicken Fingers work! Stay away from Smoked Salmon and Caviar unless you serve an aged and real bottle of Brut or Very Dry (nondosage) Champagne! Why? The sugar dosage in most Champagne is amplified by the pungent fish oils, turning the wine sweet and fishy. Since now you are going to throw out the caviar, just go pick up a buttery piece of Tenderloin. Top it off with some sauteed mushrooms, or compound butter, and add a side of cheesy scalloped potatoes. Light up the grill and... well, that is what I would do! NO lemon or tangy/zesty vinaigrette- EVO (extra virgin olive oil) and sparkling wines as a dressing will do! Now its time to start preparing the feast and shop for the bubbly, so I will leave you with just one more thought. As you reflect back on 2009 and remember the foods and wine you really enjoyed, remember that we have another chance in 2010 to rekindle the moments and make them bigger and better! I am planning to ring in my New Year with my sweetie and a few friends at my side. Then I am off for a visit to St. Louis to see my son, visiting a few blogs along the way. I will be cooking up some great January posts! *Information gathered by 'Partners In Wine' Club 2009- Adrienne Turner & Chef E Stelling, Thanks go out to R Stelling for his input! This website and its contents are the property of CookAppeal, LLC. Any use of materials on this website or printed materials, distributed without written permission, is prohibited. The CookAppeal name and affiliated logos are owned and copyrighted ©2007 by CookAppeal, LLC, and can not be used in any way without permission. Bren Herrera :: One Life. One Love. Bren's FlaNboyant Eats: Latin Fusion Cooking & Tasty Travels Under Pressure!